A New York City couple commissioned us to design this 6,000 square foot new residence on a dramatic hillside site two hours north of New York City. Initially to be used on weekends, the house will ultimately become the couple’s full-time residence. Our clients were drawn to the Palladian classicism of Jefferson’s country villas in Virginia, and this design idea guided our development of a symmetrically balanced house with a Greek Revival character typical of the local region. The plan is designed around the lifestyle of a sophisticated couple who enjoy entertaining. The large central Drawing Room with its commanding views of the Hudson River Valley and the Catskill Mountains beyond is used as both a living room and dining room. We designed a matched pair of scagliola fireplaces for each end of this room. The Master Suite with an intimately-scaled pine paneled Library, Bedoom and His and Her Bath and Dressing Rooms lies at one end of the house, which is in turn balanced by an informal paneled Family Room and open Kitchen wing at the other end. Two bedroom suites on the second floor and a separate but attached Carriage House apartment provide spacious and comfortable accommodations for weekend guests and family. 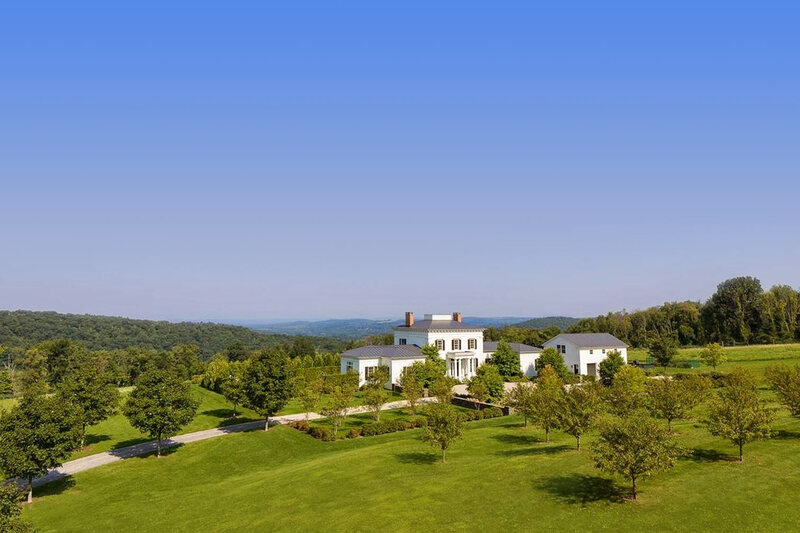 The New york designer Miles Redd has decorated the interior of the house while Charlottesville-based landscape architect Warren Byrd developed the gardens around it.